Read the MGMAT Quant book and the MGMAT verbal set to cover the foundation material. Carefully analyze my answers in the CAT to plan the next phase of study. Study the OG, and OG Verbal and OG Quant Review books. Take a timed CAT every Saturday. Analyze my answers in every CAT I take. I will have 2 weeks before the big day to spare in case I have some catching up to do. How is my plan flawed? I know it's. I just don't know why. Study the OG, and OG Verbal and Quant Overview books. After every step, try and understand if the studying has helped you get closer to your target score. PowerScore CR Bible - for critical reasoning. Aristotle SC Grail - for sentence correction. RC99(by Aristotle) - for reading comprehension. the Question Pack also if possible. All the best for your GMAT. Since it sounds like you're just beginning your studies, then it would be a good idea to take a FULL-LENGTH practice CAT Test; you can download 2 for free from www.mba.com (and they come with some additional practice materials). If you want to do a little studying first, so that you can familiarize yourself with the basic content and question types, then that's okay - but you shouldn't wait too long to take that initial CAT. That score will give us a good sense of your natural strengths and weaknesses and will help provide a basis for comparison as you continue to study. A FULL CAT takes about 4 hours to complete, so make sure that you've set aside enough time to take it in one sitting. Once you have those scores, you should report back here and we can come up with a study plan. 1) What is your goal score? 2) When are you planning to apply to Business School? 3) What Schools are you planning to apply to? As far as your plan is concerned, until you define your score goal and complete that first practice CAT, we have no way of knowing whether 2 months will be enough study time for you or not. Many Test Takers spend 3 months (or more) of consistent study time before they hit their 'peak' scores, so I would assume that you will need more time than you've allotted. I took a full CAT and scored 580. I'm extremely deficient in algebra, geometry, probability, and data sufficiency timing strategy. I'm OKish with divisions, multiplications, percentages, ratios and word problems (I do a ton of this nature on Excel due to my work nature). As to the verbal part, I'm not a native speaker but my English foundation is alright. I read about 6,000 words per week and write one third of that in highly technical and analytical stuff (I'm a consultant). That said, I felt I have a ton of work ahead of me in terms of grasping the concepts tested in the GMAT. Don't have a strategy yet, but I think I will start with the MGMAT books and sit for another mock exam to see how far I've gone. My goal score is 720+ but I will target 750 however unrealistic that may sound but I've got no choice. I plan to apply R2 this fall, and my target schools are top 5 plus NYU which is my fallback option. 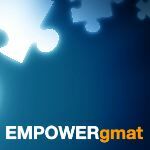 A 580 is a solid initial CAT score (the average score on the Official GMAT hovers around 540-550 most years), but raising that score to a 720+ will likely require that you make significant improvements to how you handle BOTH the Quant and Verbal sections. As such, you will likely need closer to 3 months of consistent study (especially if your real goal is a 750+). You don't have to make any decisions about that just yet though, so you can certainly study as you choose. As an aside, if you're not going to apply until Round 2, it's not clear why you're 'limiting' your studies to just the next 2 months. I suggest that you proceed as planned, then take a new, FULL-LENGTH CAT in another 1-2 weeks. That result will help to define the effectiveness of your study routine.